Are you looking for a portable freeware desktop calculator? 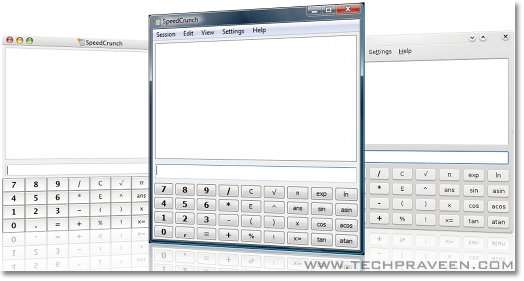 Then try out Speedcrunch.With Speedcrunch you can perform all complex mathematical calculations.It’s a fast, high precision and powerful desktop calculator.It’s an extremely fast and lightweight calculator that supports extended expressions.This Portable calculator is available for Linux, Windows, and Mac Os X. 1.At your fingertip: Just type the expression that you want to calculate and press Enter. You can see clearly what you typed along with the result in the scrollable display. 2. Unlimited variables:Advanced calculation sometimes needs memory feature. SpeedCrunch allows variables to hold calculation result. 3. Syntax highlighting: You can easily distinguish numbers from variables by giving colors to expression according to the syntax. 4. Functions, with automatic completion: Get auto-completion expressions as you type a letter. 5. Smart correction: SpeedCrunch can understand an incomplete expression. 6. Keyboard-friendly: It has got keyboard shortcuts to speed up your task.